Are you looking for garbage trucks? If YES, you come into the right page. 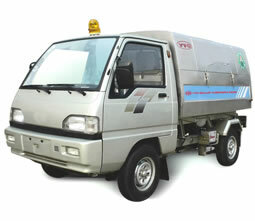 YTO Group Corporation is a garbage truck manufacturer in China, with over 50 years production and marketing experience. This enables us to know how to produce quality refuse collectors at competitive prices. Additionally, we can also produce a great variety of agriculture equipment and construction machinery, including wheel and crawler tractors, excavators, road compactors, asphalt and concrete mixing plants, and more. The following describes for you detailed information on our garbage truck, or waste collector. For more information about our other machinery and equipment, please click to specific product pages or contact us directly. (1) Designed with fully enclosed, stainless steel waste-container, this garbage truck can finish garbage collection without any secondary pollution. (2) It features simple and safe operation due to the combinational function of hydraulic, electrical and mechanical elements. (3) The garbage truck cab can be equipped with an air conditioner, which provides drivers with comfortable working driving environment. (4) Characterized by compact and great flexibility, this garbage collector is applicable for collecting wastes in residential area, old streets and so on. In addition to the garbage truck, we can also offer wheeled tractor, combine harvester, digger and cement mixing plant, etc. Now, our CE, E-mark and CCC certified products are widely used in Europe, America, Africa and Asia. If you have any need, please contact us now. We are at your service.